February 13 is all about me! T’hat’s right, it’s my birthday! You’d think i’d get the day off cooking, but alas, no. Mr Picky Palette kindly offered to take me out to a place for grown ups (yay!) while B2 and B4 are left supervised by their Aunty Beck. But before the grown up fun can commence, I made dinner and dessert for my three lovelies. Thinking something quick and kid friendly I opted for Bill Granger’s honey lemon chicken wings from February 2004 and for a special treat Real strawberry jelly from February 2011. Chicken legs are very popular in my house. Actually, any food that does not require a knife and fork is pretty popular in my house. 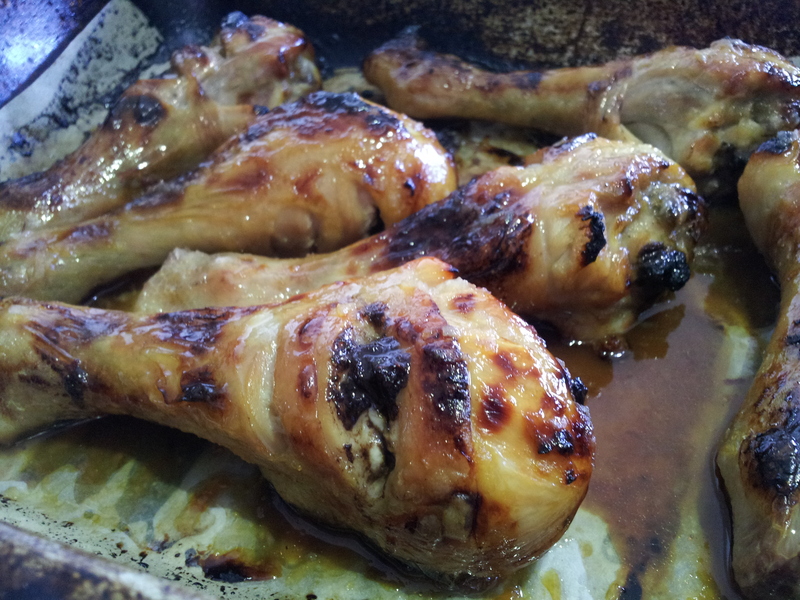 Knowing this, I swapped wings for legs and went ahead with making up the honey lemon marinade. Chicken legs go in the oven in their nakedness with a good sprinkle of salt for 30 minutes at 200 degrees celsius. Then you whip them out. Pour over the marinade, swirl them round and throw them back in the oven for another 20 minutes. During the last 20 minutes I checked on them every 10 minutes and turned them over in the marinade to ensure an even coating of sticky, sweet, savoury, lemon yumminess! The legs do take longer than wings to cook so you just need to keep an eye on them. I cooked them an extra ten minutes, then they were ready to devour. Finger licking goodness! Place lemon juice, garlic and honey in a bowl and stir to combine. Pour over chicken and stir to coat well. Cook for another 20 minutes or until tinged golden and cooked through. Garnish with parsley and serve with lemon. Up next, jelly. Not just any jelly. Real. Strawberry. Jelly! Jelly where you know exactly what made it go that glorious pink colour. Jelly with only five ingredients, none of which are scary little numbers. Real. Strawberry. Jelly! This recipe is so versatile. Swap the strawberries for any seasonal fruit. Or any juice in fact. It is after all the juice or flavour of the fruit that you combine with a simple sugar syrup and gelatine that ends up as your jelly. I can’t wait to experiment with my juicer and make apple jelly or carrot jelly or pineapple jelly! My only criticism of this recipe is that it is super sweet (probably why the kids loved it!). The strawberries have a natural sweetness to them when they are really ripe so next time I would definately halve the amount of sugar I used and just double-check the gelatine packet to make sure that my liquid levels match up with the amount of gelatine required (the recipe calls for 3 tsp). Fortunately, there was one left over, so I am off to enjoy it now. Jelly for lunch? Yes please! It is Valentine’s Day after all, and this is my gift to myself. Halve 500g strawberries. Place the sugar and 1 1/2 cups (375ml) water in a large pan over high heat, stirring to dissolve sugar. Bring to the boil, then reduce heat to medium and simmer for 5 minutes until slightly reduced. Add lemon juice and halved berries to the pan, then reduce heat to medium-low and simmer, stirring occasionally, for 10 minutes until berries are soft. Carefully transfer berry mixture to a fine sieve set over a bowl, and stand for 40 minutes or until most of the liquid has drained from the berries. (Don’t push down on the berries or the jelly will be cloudy.) Discard solids. Return the berry syrup to the pan over medium heat for 2-3 minutes until hot but not boiling. Transfer 1/2 cup (125ml) hot syrup to a large bowl, then sprinkle over gelatine and stand for 2 minutes. Whisk to completely dissolve gelatine, then stir in the remaining syrup. Transfer to a jug and chill for 20-30 minutes, stirring regularly, until jelly is thick, but not set. Pour the jelly into four 150ml serving glasses and return to the fridge for a further 10-15 minutes until starting to firm up. Meanwhile, slice the remaining berries. 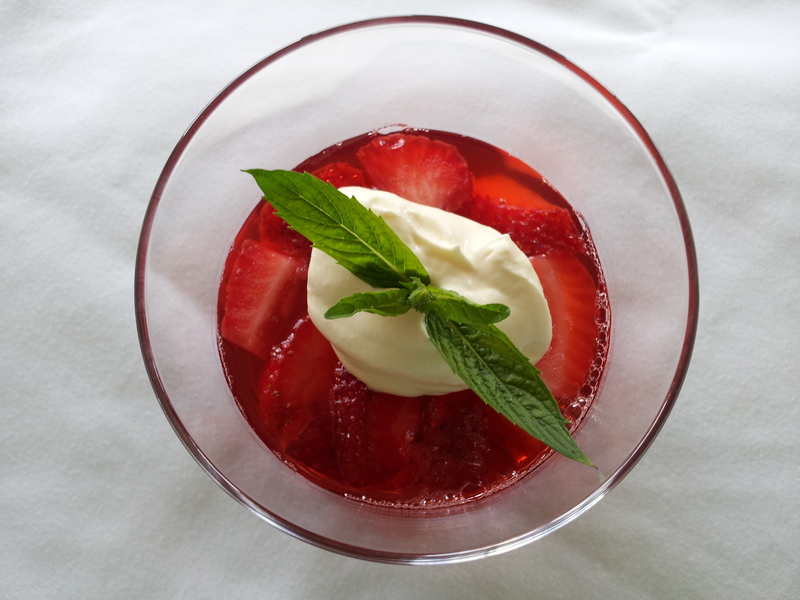 Just before serving, spoon a dollop of whipped cream over each jelly, then top with remaining berries and serve. Cant wait to try the jelly Brigitte….sounds great!